Robert Morrison, the first Protestant missionary to China and the Far East, had contribution not only to the evangelisation, but also the study of East Asian studies and even the modernisation of Far East. When Protestant, Catholic and Orthodox missionaries had freer entrance to China (from 1842 to 1949), Japan and Korea, transcultural communication was strengthened, which resulted in not only understanding but also misunderstanding. 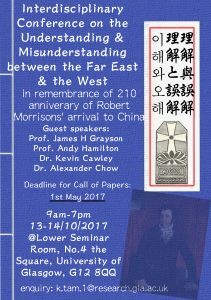 How do such understanding and misunderstanding affect the West and the Far East in 19th and 20th century? This inter-disciplinary conference aims to explore the question in different aspects so to acknowledge and recognise the academic contributions by the Christian missionaries in the Far East in the 210th anniversary of Dr. Rev. Robert Morrison’s arrival at China. Topics regarding transcultural dialogue between the Far East and the West in 19th and 20th century that are not mentioned above is also welcomed, as long as they are either related to Christianity or missionaries in general. While postgraduate students and post-doctoral have priority to present in the conference, established scholars are also welcome if they wish to present. 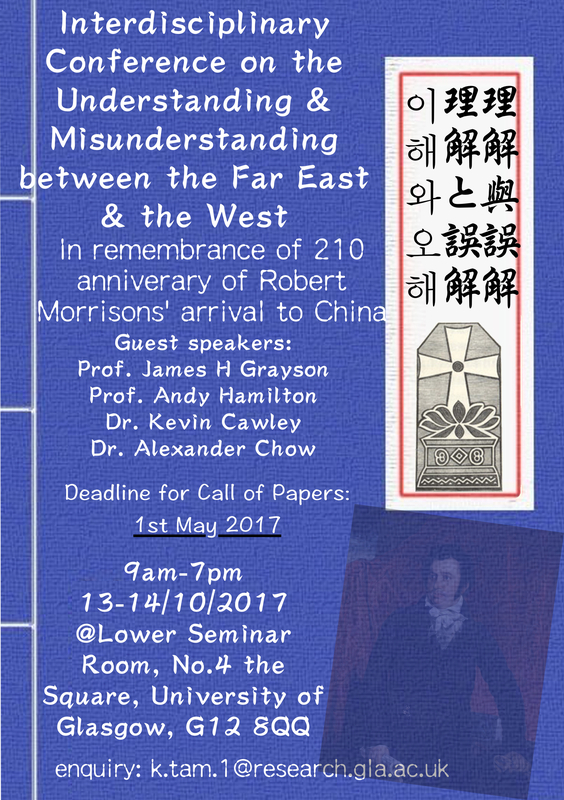 If you wish to present, please send your abstract and self-introduction (each no more than 200 words) to Andrew Ka Pok Tam at k.tam.1@research.gla.ac.uk in document format with “Presenter Application for the Understanding and Misunderstanding Conference” in the subject line by 1st May, 2017. If you are interested in volunteering in or sponsoring the conference, please send an email to k.tam.1@research.gla.ac.uk (we need volunteers).